San Antonio Spurs forward Manu Ginobili reacts in the second half against the Phoenix Suns at US Airways Center. The Spurs defeated the Suns 108-101. PHOENIX (AP) — San Antonio guard Manu Ginobili was an irritant for Phoenix long before any of the current Suns arrived in the desert. The 36-year-old Ginobili scored 11 of his 24 points in the final four-plus minutes, and the Spurs snapped the Suns’ five-game winning streak with a 108-101 victory. Tim Duncan added 17 points and 13 rebounds and Kawhi Leonard scored 14 for the Spurs, who played without point guard Tony Parker after he bruised a shin in Monday night’s loss to the Clippers in Los Angeles. Frye scored 15 of his 22 points in the first quarter. Goran Dragic had 18 points and Eric Bledsoe 15, but the two Phoenix guards were a combined 12 of 33 from the field. Miles Plumlee added 13 points and 13 rebounds. Led by Ginobili, the Spurs outscored the Suns 15-6 over the final 4:11 after Phoenix used a 10-0 run to take a 95-93 lead on Plumlee’s rebound basket with 5:10 to go. Ginobili had a tying tip-in, and then made a 3-pointer to put San Antonio ahead for good at 98-95 with 2:58 to play. San Antonio put it out of reach when Ginobili sank a 10-footer from the baseline, and then stole the ball at the other end and made two free throws to make it 104-97 with 47.5 seconds remaining. “Down the stretch I thought we did look like a veteran team,” San Antonio coach Gregg Popovich said. 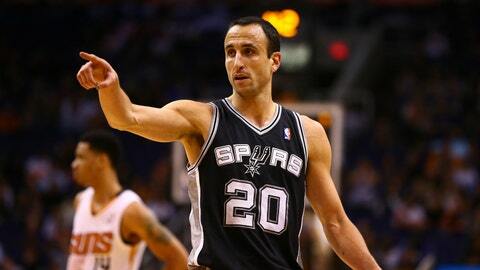 Ginobili, who also had seven assists, six rebounds and five turnovers, gave himself a so-so grade. Parker will miss Thursday night’s game at Golden State and it’s uncertain whether he will be able to play when the Spurs host the Thunder on Saturday. Leonard’s 3-pointer gave San Antonio its first lead at 46-45. There were five lead changes the rest of the first half, with San Antonio up 59-58 at the break. With 4 seconds left in the third, Dragic was fouled while heaving a shot from just past midcourt and Popovich drew a technical complaining about the call. That gave Dragic four free throws. He made three to cut San Antonio’s lead to 87-81 entering the fourth quarter. Consecutive baskets by Marco Belinelli and Patty Mills put San Antonio ahead 93-85 with 8:30 to go before Markieff Morris’ three-point play ignited the Suns’ 10-0 run. NOTES: Parker has returned to San Antonio for treatment. … San Antonio has not lost two in a row this season. … Popovich is the only NBA coach whose tenure dates to Hornacek’s playing days. … Bledsoe was 1-for-8 shooting in the fourth quarter. … Entering the game, Duncan’s career minutes (42,064) were 37 more than the 13 players on Phoenix’s active roster combined. … Phoenix has not won six in a row in three years.